Donald Trump is likely being blackmailed by Russia after being recorded on compromising video secretly taken in a luxury hotel, newly released testimony to the U.S. Senate reveals. There was a major step forward in the public’s knowledge of the Russia investigation this week, with the release of previously private testimony from the firm that compiled the salacious dossier on Trump’s alleged ties with Russia. The testimony showed that there was widespread concern that Trump was being blackmailed by Russia after having been caught in some compromising video in a luxury hotel. What would be the purpose of "blackmailing" Trump? Well, presumably to get Trump to do certain things favorable to Russia. But considering how volatile and unexpected world geopolitics is ... how quickly events pop up .... N Korea, Sudan, Pakistan etc ... what is Trump's response "supposed" to be? Is he supposed to guess what Putin would like? The only way that this could possible work is if Trump is receiving a stream of instructions from Putin. Tell me, how does that happen? What would be the purpose of "blackmailing" Trump? Well, presumably to get Trump to do certain things favorable to Russia. Yes, THUGR... but HOW is this supposed to happen? When did Trump and Putin set up an elaborate system of communication that even the NSA can't crack? Want answers to those questions read the news. Not fake news or russian state television. Want to see what's going to happen, stay tuned. Fusion GPS, the firm behind the controversial dossier connecting President Donald Trump and Russia, is apparently not done looking into potential ties between the president and the nation accused of meddling in the 2016 elections. The news comes from a report in The New York Times Monday, which purports that the barrage of attacks facing the firm, founded by former Wall Street Journal reporter Glenn Simpson, and dossier author Christopher Steele has not stopped Fusion GPS from continuing its investigations. Based on multiple people briefed on the research, The Times reports that Fusion is still looking into links between Trump and Russia. The specific line of inquiry, however, remains under wraps. Why would they be wasting their time if there was nothing there? Tick tock, tick tock. Trump could be taking bribes, rather than being blackmailed, in an elaborate system full of secrecy that NSA can't bother to crack. It's Trump's real estate transactions with anonymous buyers hiding behind LLCs. Data uncovered by USA Today reveals a huge shift in how clients of the Trump Organization buy. In the two years before Trump became the Republican presidential nominee, just 4% of his customers used LLCs to buy his real estate — now that number is at 70%, USA Today reports. If and when those buyers sell their apartments, they stand to make a much larger windfall on the profits, following the tax bill’s passage. Shell companies are often used in the real estate sector to hide owners’ real identities, as well as for their potential tax benefits. At least one Trump buyer told USA Today that the anonymity motivated him — alongside other financial benefits. But shrouding buyers’ identities in secrecy creates an ethical quandary: if watchdogs don’t know who they are, it’s very difficult to know if buyers are currying favor with the president. Trump’s independent ethics advisor Bobby Burchfield told USA Today he has a four-point test to evaluate whether it would be proper to sell to a given customer, but he reportedly refused to say whether he turned down a single real estate deal in 2017. Trump has said he would not involve himself in business dealings as president, instead leaving it to be run through a trust by his sons. However, there’s no legal provision in that structure to stop him discussing its activities with them, and he can withdraw money from it at any time. Of course you're right. Trump made 35 million in real-estate dealing in 2017. I would add, we don't know what the NSA is doing regarding Trump. It's not like they're going to tell us. I think it's safe to say Mueller is following the money. Any and all ties to russia Trump has goes to motive. Because they're getting paid to do it? Because they have an ideological grotch against Trump and are trying to "get" him in any way possible? Because they're stupid and/or paranoid (like you)? 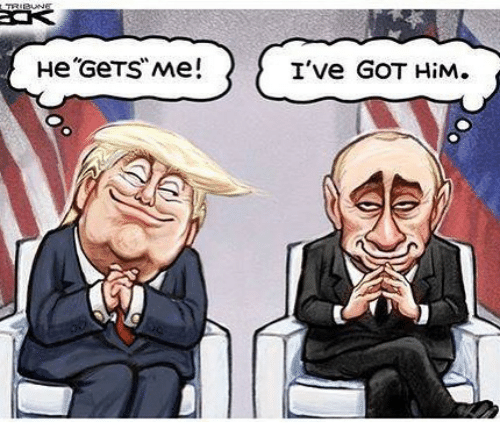 Just as a reminder, you have absolutely no idea how Trump gets his instructions from Putin, but you're absolutely convinced that it's happening. What "instructions" are you thinking that would take longer than, "remove sanctions, back Nato the hell up. You have 1 year or I let the dogs out" ??? How long did that take you to read? And that's if you are so simple to think any "instructions" would have to come directly from Putin. Trump gets his instructions the same way sig does. He watches russian state TV. Which one? There's probably more than one that get state funding, and I presume they say somewhat different things because of their varied audiences. "Backing up" means "supporting". In English, what you posted was ... "Support Nato like hell". English not your first language? I guess you must know what "russia" wants because you're Russian. There are at least a half-dozen words or phrases you could have used GSTRING, including reverse, retreat, withdraw, and move back; and not quite as aptly recede, disengage, or retire. Russians accuse Democrats of conspiring against Russia. You think Putin communicates with Trump thru RT? I guess you read RT then. Well, at least that's on record, comrade. Again sig spins on behalf of russia. No, I'm just pointing out that every statement that you make is just empty paranoia. You said that Putin is communicating with Trump through "Russian state TV" but you have no idea what outlets might be involved or what their content is and whether or not it relates in any way to Trump's foreign policy. You toss out global accusations that you can't back up because you have absolutely no knowledge of ... well, anything, really ... and you're just operating on empty-headed emotion. ... and you're just operating on empty-headed emotion. From my watching RT, the Russian message is simple: Russia good, Democrats bad. I know Trump got the message because he keeps repeating it: "Russia good, Democrats bad." From my watching RT, the Russian message is simple: Russia good, Democrats bad. I assume that RT WOULD say "Russia good". As far as them focusing on Democrats specifically being bad ... as opposed to, say, neocons or the military-industrial-security complex in general ... my guess is that RT would say that they're ALL bad. I'm sure that RT had unkind things to say about John McCain, for example, seeing as he was the storm-crow that preceded all of our "interventions" in eastern Europe and parts of the ME. The tighter the noose on Hillary gets, the more her sycophants and trolls spread lies. During the campaign, Trump's supporters seemed to agree that Trump was the alternative to establishment Republicans who engaged in gratuitous military adventurism. Now, when left to his own devices, he seems to positively enjoy goading a nuclear-armed enemy. Which raises the question: What happens if he’s left to his own devices? What happens if those advisers actually do leave? We may be about to find out. Why stay with the administration? At this point, it’s clear to everyone who might become any sort of policy adviser that there is no hope for a grand master plan of anything, no hope of getting any expansive policy agenda to catch Trump’s extremely limited attentional bandwidth. That’s true whether you’re a MAGA America Firster or a conventional Republican. It’s also clear that Trump has lost a great deal of political capital, limiting legislative options even if he would listen to his most ambitious and savvy advisers. And one more thing is positively pellucid: Anyone who joins this White House can look forward to unprecedented levels of chaos, infighting and backstabbing, under a boss who will not respect them, or listen to much of anything they have to say. Please, get your facts straight. KJ-UN is a crazy cult leader who holds an entire country under his tyrannical thumb. He, not Trump, is the mad man here. Thankfully, Trump is the 1st President we've had in 30 years who'll stand up to 2 bit thugs like Un. US politicians, as with most others around the world, absolutely love to put on these displays of authoring ' grand plans ', involving multi year steps in progress, awe inspiring way points and lofty sounding goals... none of which ever pan out. In short, the "establishment " tries to LOOK important because that's what sells the dumb masses. Trump? He's like ' screw all that, let's just get stuff done. Worry about who gets the credit later ". And of course, he's expecting to get the cred himself. Which so far, in year one , is fine by me. Which is it? You've been watching for 3 years but... not regularly.... so your authority is... bullishit. Off and on for three years or so. That describes my level of knowledge about right. Their pro-Russian bias is pretty clear; you don't need to get out a magnifying glass and scrutinize RT on a daily basis to learn that! I think I look into RT maybe once or twice a month ... enough to detect changes in their regular programs, enough to guess what their bias is, but not enough to know what they post about day-to-day. Is that clear? Or are you going to continue to be stupid? Two sources at ABC News told CNN that Daniels was in touch with producers at ABC's "Good Morning America" in the fall of 2016 about a potential interview and was prepared to discuss Trump. I see Trump the racist still has he defenders. We all know why.